Articles and resources for software product managers and designers. This week I wanted to add a short pre-amble to the newsletter just to say thanks. A bunch of you have signed up for the newsletter since I started placing more emphasis on it a few weeks back. I'd love to hear your feedback on what you like (and don't like), so you can reply any time if you'd like to chat. Onward, to the links! Blindly following process is a project-killer—not just in terms of efficiency. The real poison is the mentality: in these cases process became a crutch to lean on, with these individuals no longer thinking critically about their tasks. In many ways, the process became the job, where process really should be what enables the job. This rings doubly true in the software development world. On any team, you want your process like you want your porridge: just right. If you have too little, the team may not know what the priorities are, or who is responsible for the next step. Too much, and your team will end up doing more process than actual work. The right strategy should be flexible enough to fill in the cracks of the team’s blind spots while enhancing their strengths. It’s up to the PM to find that sweet spot. Engineers don’t hate process. They hate process that can’t defend itself. Slowing experiences down with intention and adding deliberate requests for user action at critical moments in a user flow makes for better experiences in the long run. Bring a level of consciousness to your designs and address the pressures you may have to reduce friction at all costs. If adding an additional click means giving users more freedom, go with the extra clicks. This level of awareness in your design enables users to make conscious choices about when, where and how to engage with your products, rather than acting on autopilot. This morning I clicked on a link to read a blog post, and within 3 seconds of arriving the popup above stopped me in my tracks. I am asked to provide my email address before I’ve had any opportunity to determine if the site might have value to me1. I came to the site to read an article, which means I intended to spend time there. 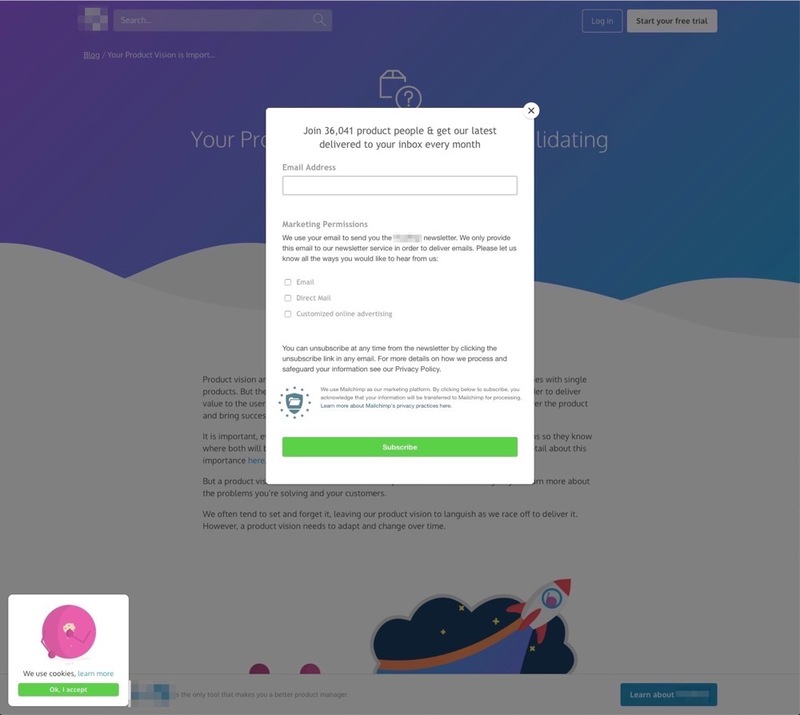 By serving a pop-up just as I enter the site, it is preventing me from seeing any value until I make a decision about whether or not to give them access to my email. In a discussion about this topic on Twitter the most common defense I heard is that the sign-ups are worth it even if the method is sketchy. I disagree with that, and firmly believe that product growth should never happen at the expense of users. It might take longer to get right, but I would rather work to find ways to create more value for users and attain product growth that way, than resort to tactics that are hostile. Which brings me to the topic of growth hacking. I think it needs to be said that all growth hacking methods, at their core, use human psychology to get people to do what you want them to do without taking their needs or intentions into consideration. The founder of the term defines a growth hacker as “a person whose true north is growth.” Growth at any and all cost. When we talk about this type of growth it’s usually in the context of persuasive design and habit-forming products, which have implicit goals to “nudge” people into directions they didn’t intend to go. I don’t think this an ethical practice, and I think as product managers it is our responsibility to put an end to it. Instead of evaluating features and ideas based on the concept of “growth at any cost”, let’s ask the question “growth at what cost?” to guide our decisions more. Let’s find ways to grow that respect users and their intentions, not subvert them. As product managers, we should always manage our backlog so that the next most important thing is at the top of the list. Many times, the bug you would work on is less important than other things on your backlog. By working on the lower priority bug, you are deferring the more important work that can help you reach your strategic goals. The flip side of this is also true: sometimes the next most important thing may be five or six bugs that really need to be fixed before adding yet another feature on top of a fragile platform. If you live in a world of separate queues or say you’ll always devote 20% of the team’s time to bugs, you actually lose the opportunity to say “this week, we are squashing these bugs that have been plaguing us before we do another thing.” In reality, you will likely have a mix of bugs and features in your backlog, but the most important thing is that you prioritize strategically and intentionally, not letting a false constraint determine what the ratio of your backlog looks like. This is an exciting development for product managers, especially if you’re building something in the B2B space at a smaller company. With a really good product it’s becoming so much easier to sell to larger companies without the need for the bureaucratic checklists that used to be an impossible barrier to break through (“Are you ISO 9001 certified?”). [Slack] have had a methodical process of continuing to drive strategy up market. They started with individuals and small teams, and then departments and bigger teams, and now broader enterprises. It’s been a very thoughtful strategy. If you found this newsletter useful, please share with your network! Want to have slow, meaningful discussions with your fellow PMs? Join the world's smallest product management community. You are receiving this email because you signed up on elezea.com. You can update your preferences or unsubscribe from this list.